What is this eager young student doing with wet sloppy newspaper? Why, creating a habitat for mycelium of course! In lab we learned that fungi like it wet and they like it dark. Wet shredded newspaper in an egg crate or other container is the perfect place for the hyphae to grow, colonize, and fruit. Here is an example of a fungi that is starting to grow its stalk. It took about 3 weeks before the hyphae colonized the container and decided to create the mushroom. Look at these gorgeous mushrooms that popped up OVERNIGHT! 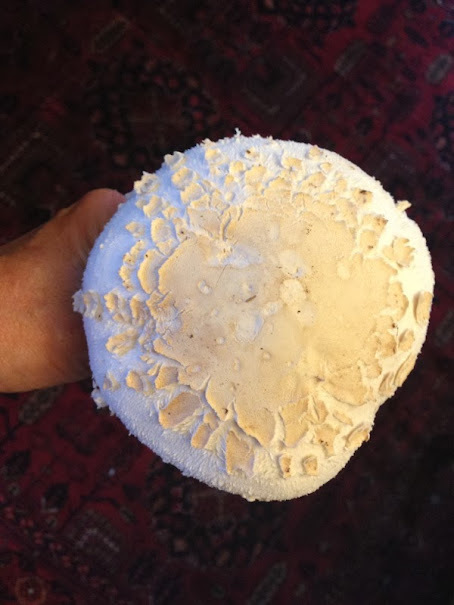 The type of mycelium I purchased was from the Oyster mushroom. I found them to be quite tasty. Even our local grocery store sells them. One student is now a confirmed (by his mother) mushroom eater. See the ring around the stalk? That's another possible indicator for a deadly mushroom. Strike two. Strike three. The base of the stalk tends to be bulbous for deadly mushrooms. Maybe I have a "winner" here. Perhaps I should contact SCUM to find out for sure. They are our local group of South Carolina Upstate Mycologists. And by the way, I did wash my hands after handling this gorgeous mushroom. This is my son Nathan sitting inside a ring of the same mushrooms I found in the goat pen. If anyone can help me identify them, please let me know.